The use of two microphones for audio processing. Apart from the obvious aim of signal to noise ratio (SNR) improvement, stereo microphones are used to estimate the spatial source of speech using relative time delay of samples at the two microphones. In a scenario where prior knowledge of the direction of the desired source is known, this information can further be used to suppress undesired noise and speech. 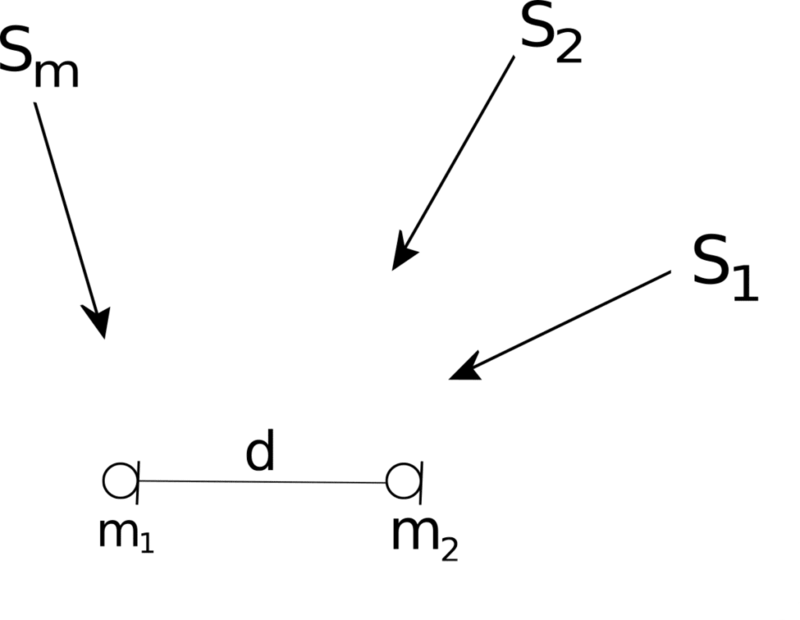 Consider an acoustic signal impinging a microphone array as shown in Figure 1 below with generalized latex microphones. The cross correlation between the two microphone signals can be leveraged to get the estimate of and hence the spatial direction of each frame. An adaptive estimator to smoothen out spurious noise can be used. An example of the output of such joint beamforming and nullforming is shown in Figure 2 below. The signal to noise plus interference ratio improvement is more than and no distortion in the desired signal.